Saint-Gobain’s plant in Sully-sur-Loire, France, focuses on glass production for the armoured and aeronautical industries, and the civil market. In their shift towards industry 4.0, management has deployed collaborative robot cells to free employees from tedious, repetitive tasks. 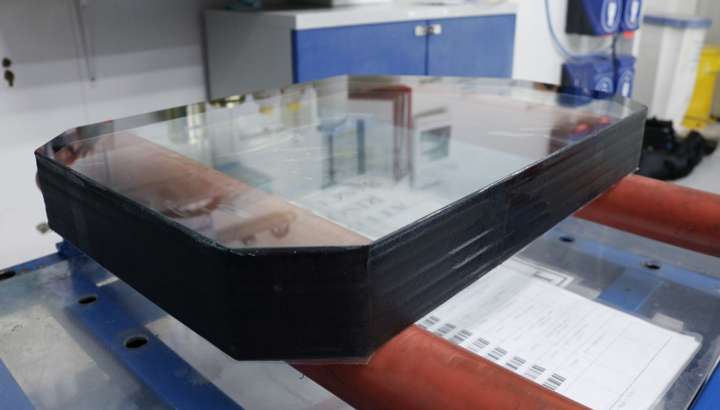 Robotiq’s FT 300 Force Torque Sensor has proven essential to automate the grueling glass polishing process. Saint-Gobain was founded in 1665 as a public society manufacturing luxury mirrors and glass under King Louis XIV’s reign. The corporation kept high quality standards through the centuries, expanding its business throughout the whole housing industry. Now a global company, it employs more than 185,000 people worldwide. Near its original headquarters in the outskirts of Paris, Saint-Gobain still works on high-end glass production. Human labor provides high-value work to the finished product. But some tasks are more tedious than others. 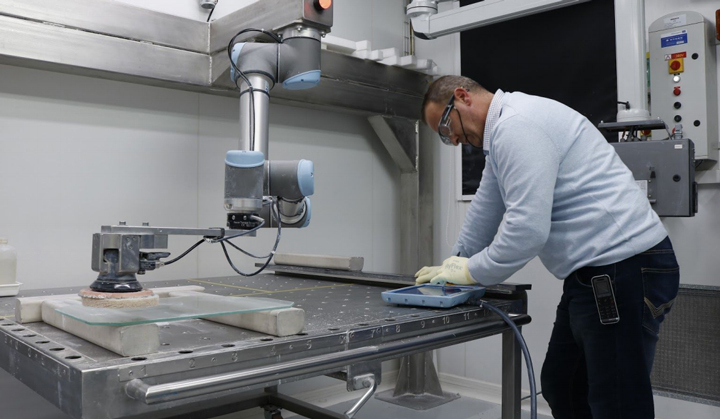 This is why the Sully-sur-Loire factory, like many other Saint-Gobain plants, began to deploy collaborative robot cells into their process about a year ago. Capacity increased by 30%, allowing Saint-Gobain to deliver orders on top of those initially scheduled. “A product might come back once every one or two years. We often have to create a new program. 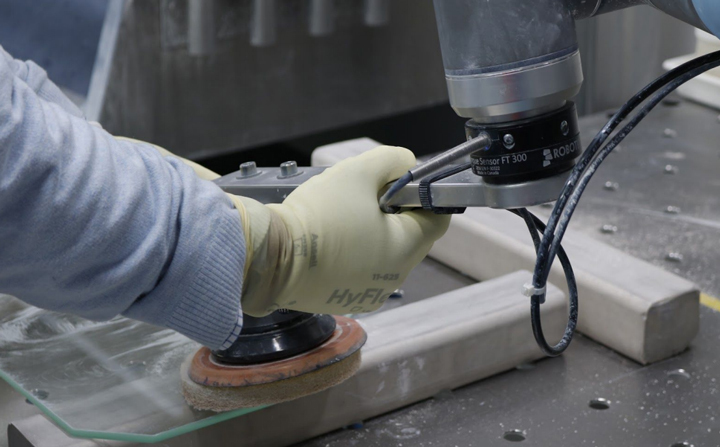 By empowering the operator, allowing him to do the program himself, we avoid calling an integrator every time a product comes back into production. 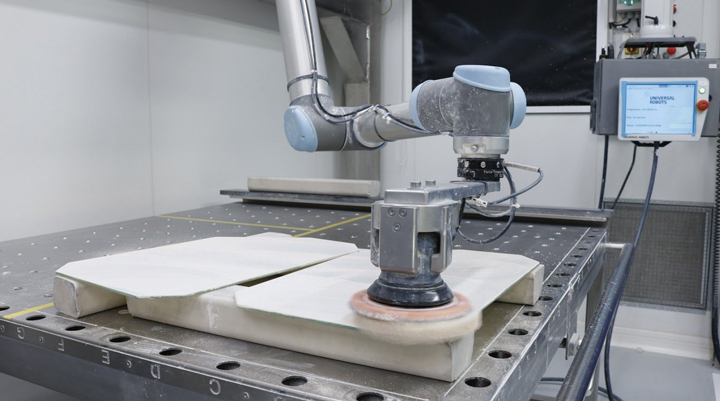 This is one of the goals of our digital manufacturing project, in which cobots will play a huge role,” Sanchez explains.